SONGEA, Tanzania, October 9, 2009 – Miracle Corners of the World (MCW), a non-profit organization that empowers youth to be agents of change in their local and global communities, sent its eighth dental outreach team to Tanzania in August to deliver free preventive and acute oral-health care pre-school kids, high-school students and the larger community. The team of professionals volunteered their time and expertise out of the MCW dental clinic located at MCW’s youth center in rural Songea. During the week-long visit, the team provided 122 children and 83 adults with restorative dental work. They also offered oral healthcare education, screening and fluoride varnish treatments to pre-school and secondary school students and helped the clinic’s staff take inventory, maintain the dental equipment and monitor infection control practices. Working in partnership with the Songea Municipal Council, MCW opened the Liana Cohen Clinic in August 2005. Henry Schein Cares, the corporate responsibility program of Henry Schein, Inc., the world’s leading dental and medical supplies provider, provided equipment inkind and technical assistance. Today, the clinic, which is staffed by a dental therapist and a dental assistant, is one of only a few fully-equipped dental facilities in the country. The visit is part of MCW’s continuing efforts to make the clinic sustainable year-round. To make this happen, over the last two years, MCW has partnered with the Muhimbili University of Health and Allied Sciences Dental School (MUHAS), Tanzania’s only school of dentistry, on a number of initiatives. Thanks to in-kind support provided by a number of leading dental equipment and supplies manufacturers and distributors, MUHAS received state-of-the art dental equipment and technical expertise. This upgrade has enhanced the school’s ability to attract new faculty and train more dentists. About Miracle Corners of the World (MCW) Miracle Corners of the World (MCW), founded in 1999, is a US-based non-profit organization serving youth worldwide, primarily through leadership training, community development, and oral healthcare programs, as well as partner initiatives. MCW empowers youth to become agents of change, to improve their lives and contribute to their communities. To achieve its mission, MCW works closely with a global network of friends, volunteers and supporters from the public, private and nonprofit sectors. For more information, visit www.miraclecorners.org. o Dr. Jill Fernandez, a Dental Hygienist and Clinical Associate Professor in the Pediatric Department at New York University’s College of Dentistry. This outreach is her third in Songea. o Dr. Elizabeth Lee is a Dental Resident at the Montefiore Medical Center in Bronx, NY and a recent graduate of the Tufts University School of Dental Medicine. She has previously participated in an outreach program in Nicaragua, which provided dental treatment to underserved communities. o Dr. Patrick So is a New York University College of Dentistry graduate. He has participated in outreaches in Alaska and the Dominican Republic. o Felix Nyakatale is MCW’s Tanzanian Country Coordinator. 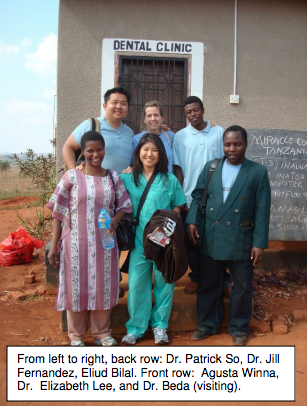 o The team worked with the clinic staff, Eliud Bilal, dental therapist, and Agusta Winna, dental assistant.